Below is a copied post from Korea Tourism Organization Manila as they look for 15 Korea Fits You Supporters for this year.... Yep, here is our chance!!! 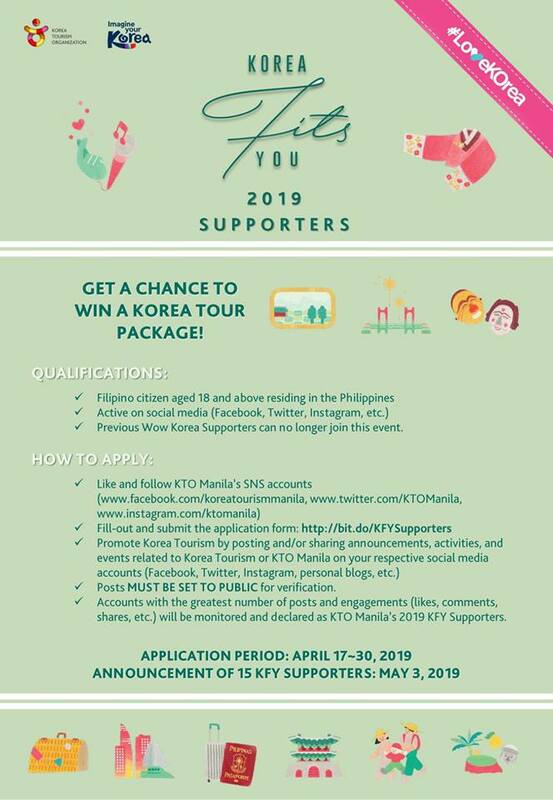 Be one of KTO Manila's 15 Korea Fits You Supporters and get a chance to win a Korea Tour Package! **Previous Wow Korea Supporters who have been awarded a tour package or round trip ticket to Korea can no longer join this event. - Posts MUST BE SET TO PUBLIC for verification. - Accounts with the greatest number of posts and engagements (likes, comments, shares, etc.) will be monitored and declared as KTO Manila’s 2019 KFY Supporters. As if my previous trips in South Korea are not enough, I am here composing this article while hoping to become one of this year's Korea Fits You Supporter. Back then, I thought that as long as I am able to set foot in Seoul then all should be fine and I'd stop hoping for a Korea trip but boy I was wrong, very very wrong.. :)) Three trips after, the only thing that happened is that my lists of places that I want to visit and foods that I want to try became longer or in this case, maybe I can say NEVER ENDING. At the moment, I still have no plans for another trip though I'd want to go back before my tourist visa expires next year. If I'll be chosen to be part of this Korea Fits You 2019 Supporter, at least there's something to look forward to and something to do/accomplish while waiting. Also, it'll be fun becoming the source of information for my fellow Korean culture enthusiasts. Gwangalli Beach - this is the beach on this post, on the horizon from that beach is Gwangandaegyo. Above is a picture of Gwangan bridge from the entrance/exit of Igidae Coastal Walk. If you want a picture where the bridge is as close as possible then this is the place you have to look for. As you may or may not know, my Busan trip was a solo trip and I only met my friends from the hostel where I stayed at. 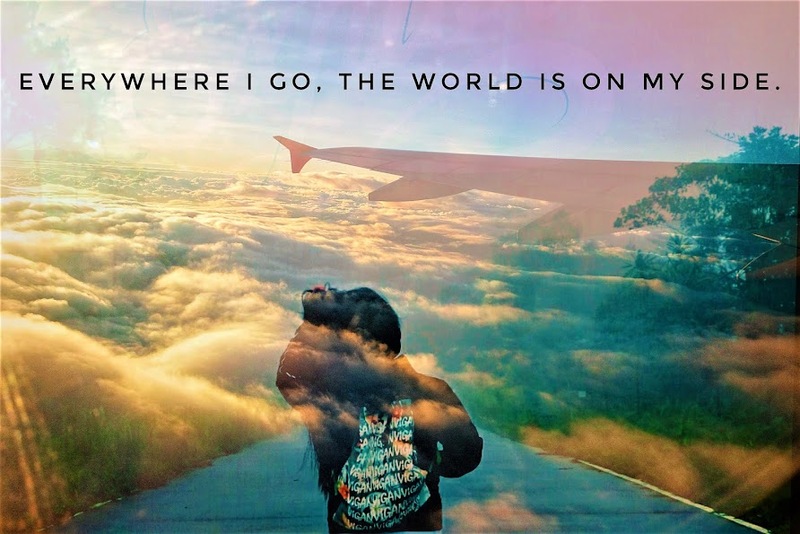 That's the reason why for some days, especially the first few days, I was alone when touring the area. This was one of the places that I saw while looking for the must-visits in Busan but it looked far to me during the first few days since I was living in Haeundae and the only time that I got a glimpse of it was when I was in Moontan Road. These are just some night photos since I didn't do anything there aside from watching the light show at the bridge. Although it's not as captivating in the picture, there's a reason why this is considered an icon in Busan. Ang ganda niya tignan lalo na kapag sa gabi. It's only now did I realize that I wasn't able to go there at daytime. BELOW ARE THE PHOTOS OF THE BRIDGE TAKEN AT DIFFERENT LOCATIONS IN BUSAN: 'Cause I can proudly say that in my one month stay there, I've been to a lot. Much more than I expected and hoped for, tbh. Above is taken from Shinsegae Mall. If forgot which part but it's from one of the walkways there. Zoomed in bridge from Moontan Road. The picture above and the four pictures below are taken along Igidae Coastal Walk. I've walked through all of the places above though I haven't completed my Busan trip posts at the moment. Above is taken from Jangsan Mountain, yep that mountain from the other pictures (in Igidae). See. If the photos aren't enough to show how much of Busan was I able to explore then I don't know what will. Japan trip wouldn't be complete without eating sashimi and sushi, of course. On our last day, we were looking for an eat-all-you-can restaurant but we weren't able to find one so we ate our then last meal in Japan here in Uobei. I love Genki Sushi here in the Philippines so upon knowing that they are under the same company, I didn't have hesitation and we immediately got our number. Compared to the table seating arrangement here in PH, the one in Japan is on the counter so the order tablet is also per person. Not bad. WHAT I LIKED THE MOST IS THAT MOST OF THE PLATES WERE ONLY 108 YEN EACH. Half the price of those being served here... for 1,000 Yen it felt as though we also ate at an eat-all-you-can. SALMON for only 108 Yen. Huhuhu! I wanted to eat more but I was too full already after eating nine plates of sushi. Weakshit?? hahaha! From Hakata Station, transfer to Yodobashi Building and the food court where Uobei is on the fourth floor. Very easy to locate. This is the closest mall to our hotel in Fukuoka (The Life Hostel and Bar Lounge). We didnt't have the time to walk around the mall nor the budget to shop aside from the things that we already allotted money for - Uniqlo, souvenir shops, and shoe salons are the only stores we entered here. However, since the mall was nearby and on the way back to the hotel from Hakata Station, we went there twice just to watch the fountain show at night. My friend, whom I traveled to Japan with, and I have a thing for water fountain shows - we've seen the one in Bellagio Hotel, Las Vegas and the one in Wynn Palace in Macau too. Aside from the water fountain show, I liked the pastel colored lights of this fountains. On the right side of the fountain were doraemon statues. Of course, we took pictures with it. Doraemon was one of the shows that I enjoyed when I was younger. Those days na gigising ka ng maaga tuwing Saturday para manood ng TV at abangan si manong taho. haha! SO SAAN NA TAYO NEXT, DORAEMON? ?